Andy Goode was for many years the metronomic core of Leicester Tigers' backline, a reliable goal-kicker and an excellent tactician. Goode began with Leicester as a youth player, winning caps for England at U18 and U21 level, but he left to join Saracens following an immensely successful period in which the Tigers won four successive league titles and two Heineken Cups. After an unsuccessful stint under Rod Kafer at Saracens Goode returned to the Tigers. Following consistent performances for Leicester and England 'A', Goode made his international debut as a replacement for Sale fly-half Charlie Hodgson against Italy in the 2005 Six Nations. His international career did not take off however, and he won nine caps between his debut and November 2006 before vanishing from the international stage. 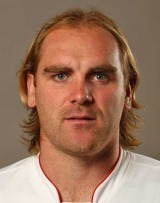 He continued to play for Leicester until leaving the club for French Top 14 side Brive in 2008. In France, Goode found his form rejuvenated, dominating the scoring charts in the Top 14 and further honing the merciless accuracy of his kicking under the ELVs. In January 2009 he won a recall to the England starting line-up against Italy in the opening game of the 2009 Six Nations, ousting Danny Cipriani from the squad. He won the last of his England caps against Argentina later the same year but was retained in the elite squad for the end of year internationals. He was omitted from manager Martin Johnson's plans for the 2010 Six Nations and later embarked on a short-term contract with Super 14 side the Sharks and later confirmed he would be joining Premiership side Worcester the following season. His Super Rugby career began against the Crusaders in Christchurch and his debut lasted just five minutes before he was handed a yellow card for a high tackle on All Blacks fly-half Dan Carter.